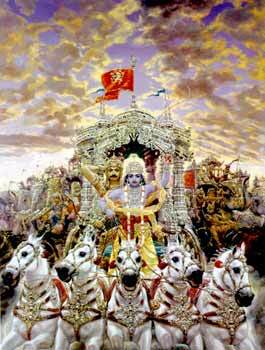 Question to Radhanath Swami : Why was Arjuna forced by Krishna to fight? Radhanath Swami : Arjuna was told to act like a surgeon. If a person has a serious tumor and if it is not cut out, the person dies. So surgery in one sense is violence. It is taking a knife and cutting a person, open. Now, open heart surgery is really a violent surgery; the ribcage is cut open. But is that surgeon violent? Yes, he is violent, but he actually helps the person. So Arjuna was like that. He was fighting for Dharma. He was fighting against exploitation and greed, which was represented by Dyurodhana and his brothers.